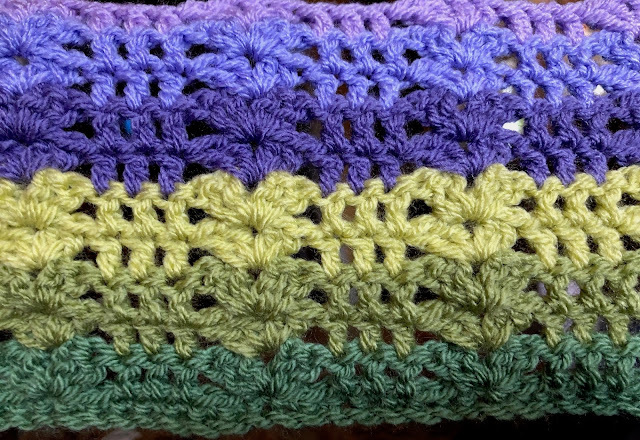 The CAL (Crochet-a-long) with Lucy from Attic24 blog began on Friday. 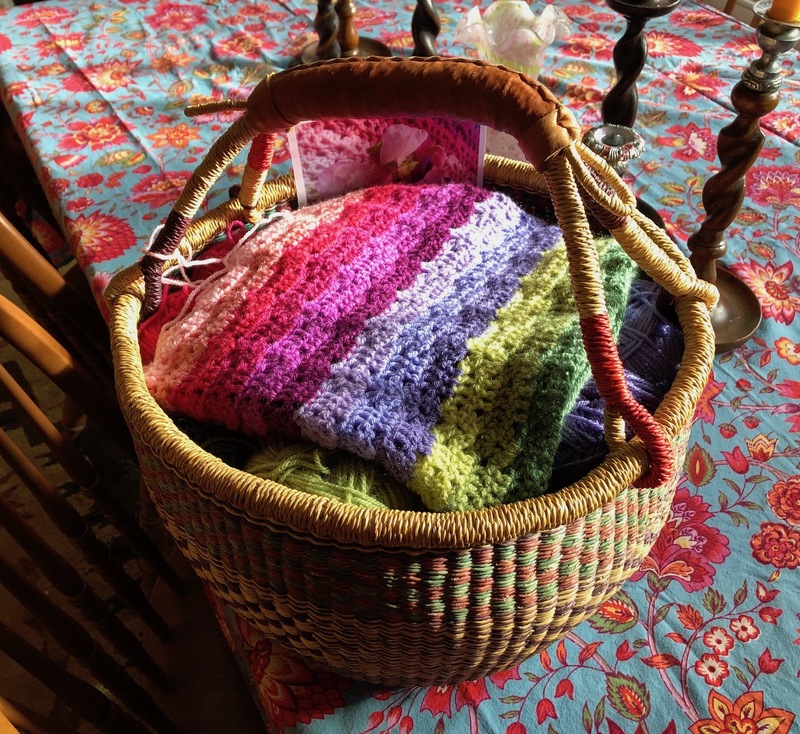 I had my big squishy Stylecraft skeins/balls of yarn in a big basket all ready to go. If you're interested in joining in it's not too late. But lets begin at the beginning.. 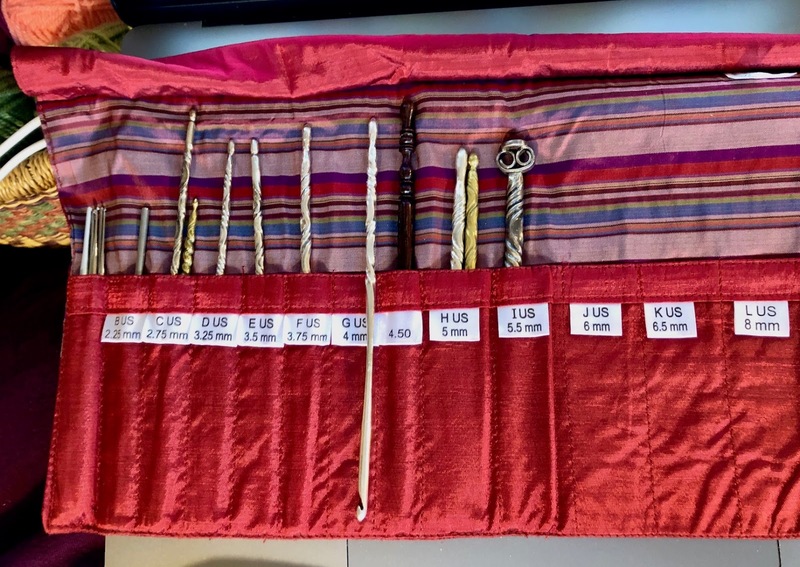 I unrolled my crochet hook organizer and found my G sterling silver crochet hook. I've used the G hook for my Lucy projects and it works perfectly. I found the beginning of Lucy's pattern instructions and began to chain 214 of the base.. that's always the worst part.. keeping track of the number!! After re-counting 3 times.. lol.. I began the first row which is US double crochet all the way across. 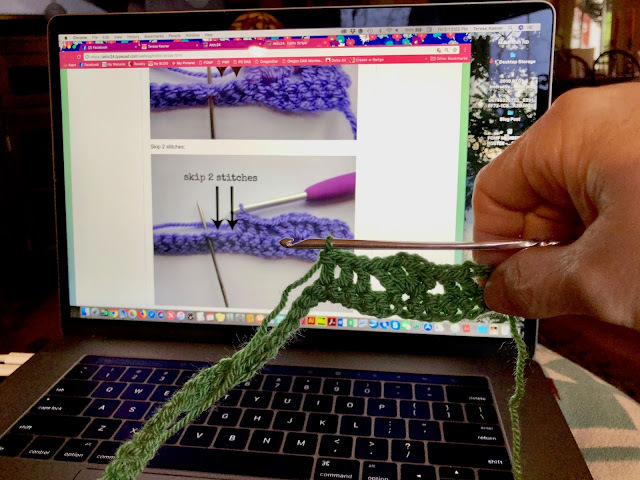 The English call it a treble crochet.. this is the tricky part of doing Lucy's patterns as the names of the stitches are totally different. Our single crochet is the UK double crochet! ::Whew:: the second row done with the pattern begun. 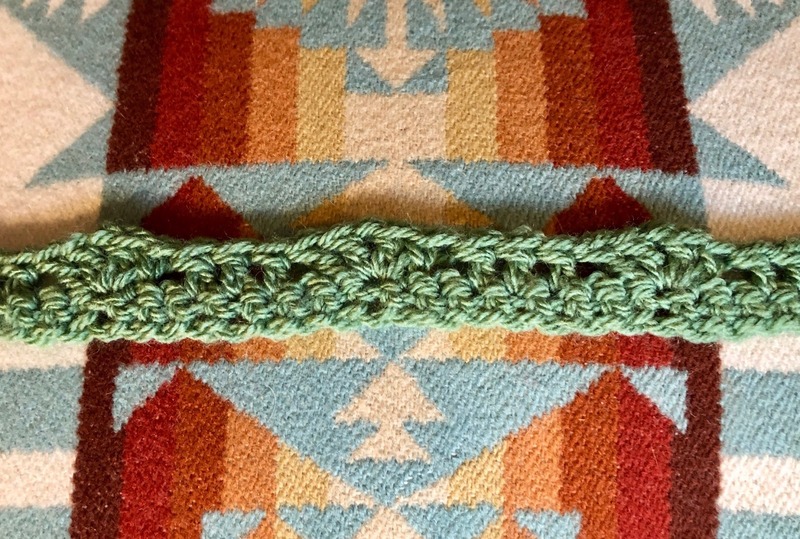 I am finding this a very easy to do pattern and it's very pretty. 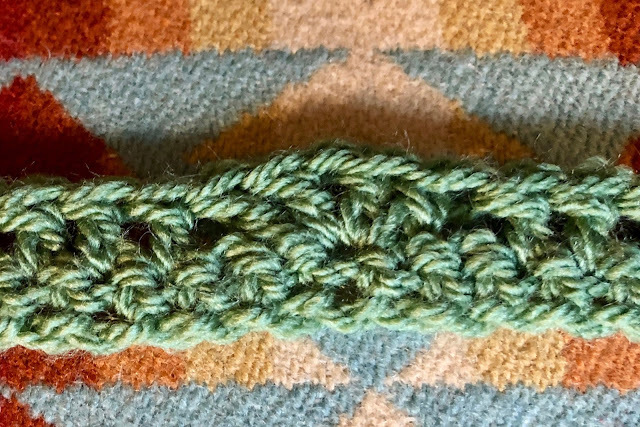 It's 3 double crochet, skip 2 spaces, 2 dc, sp, 2 dc which makes the "Sweet Pea". I also like that this is a reversible design, the Woodland had a right side and a wrong side. Do you see the little flowers? The upright posts are the trellis part of the design. I think it's so clever! Lucy has 3 colorways for us to choose from. "Posy" is a random stripe, "Colorwash" is a flowing color design and then she did a color sample to show us and many of us fell in love with that idea. And then.. there is a group within the group calling ourselves "Team Rogue".. lol.. which is doing our own color selections. This is what I have done so far. 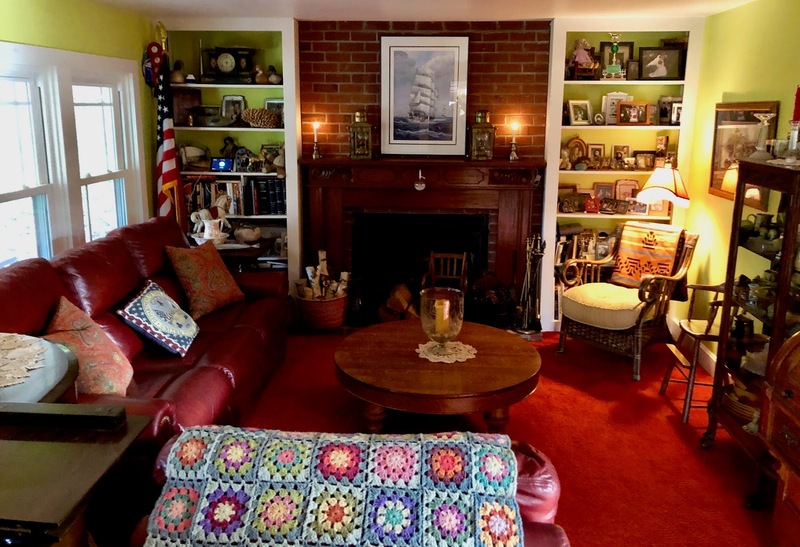 We have the living room back to normal.. all traces of xmas are stowed in the attic. Our youngest son Travis and his wife Kristi and their boys came for a visit last Friday. Dayle made "Chinese Noodle Casserole", a family favorite. 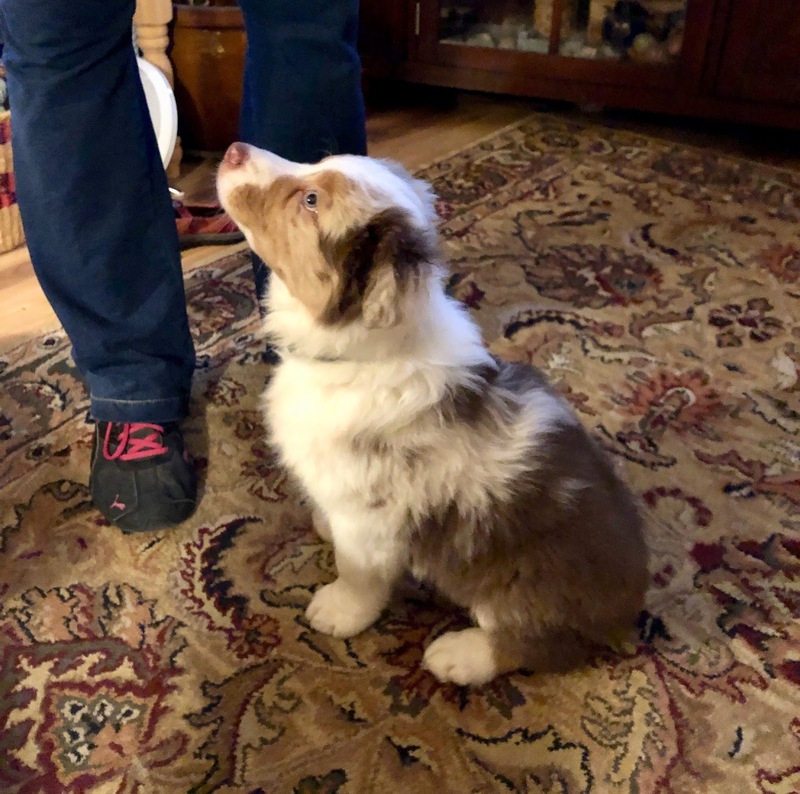 They brought little Ozzie - I was amazed at what Kristi had trained him to do.. at the age of just 8 weeks old. He comes to his name and sits! She is now working on crate training him. I am off to swim in a bit. It's going to take some doing to get back to the speed I was before I got ill and then the holidays. I was doing a 3 minute lap (to the end of the pool and back). In the dog's defense, he looks very remorseful. I wonder if your Chinese noodle casserole is our Chinese noodle casserole. Ours is a very easy one with leftover turkey or chicken, mushroom soup, celery & onions. Aw that puppy is just so focused on the sit! But lets talk about your crochet blanket. WOW. You are nailing it lady! Wow! Crochet goes FAST! It looks beautiful. Your blanket is going to be gorgeous! I love all of those colors. 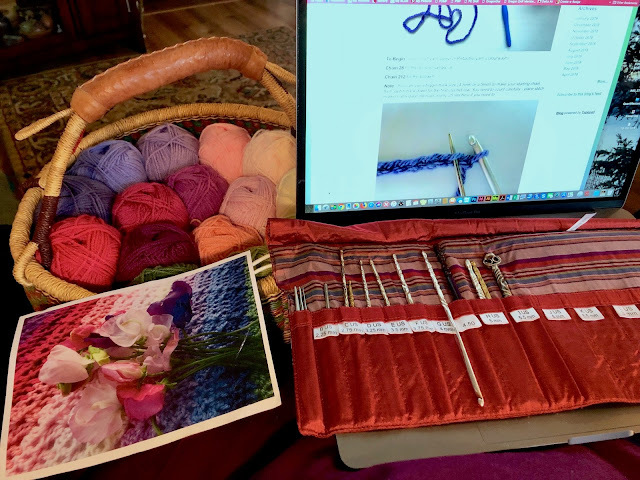 I’m working on my “mystical lanterns” pattern which is also from the UK. I have to keep reminding myself about the stitch differences. I love your little fur babies. They both look very cuddly and sweet. The puppy has grown a lot already! We have sunshine now. A couple of hours ago there were snow flurries coming down. You never know what’s going to happen here. Just wait a minute and the weather will change! Christmas is all gone at our house too. In a way it’s a relief, but I do miss the pretty lights. Have fun swimming! I love all the beautiful colors that you work with. I used to knit, but have not done so for years. Our daughter knits and crochets and has made lovely things. I must direct her to your blog, Teresa. I can't believe how much you've already gotten done on that colorful blanket!! Our tree is still up...but I think Fletch agreed to take decorations down this coming weekend. Yay!! 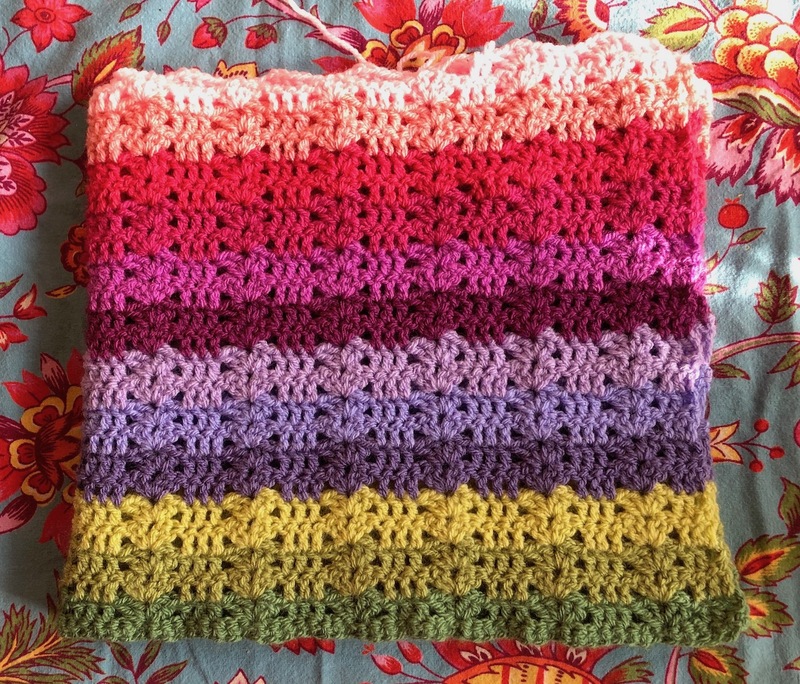 I love the colors that you chose for your blanket, they are lovely. We took the last of Christmas down today and it is now safely stored in the basement until next year. 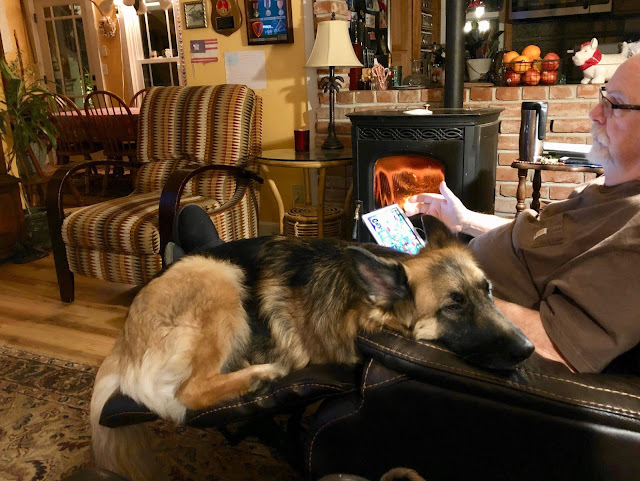 Now we are "hunkered down" for a snowstorm that may or may not drop a lot of snow on us. I love when the meteorologists are confident of their predictions! Have a great week! Beautiful throw, love the colour combination. I smiled at your lap dog, Mickey too likes to sit on our laps and forgets how big he is. Hope all goes well at swimming. Your blanket is growing quickly. I usually have to write down a UK pattern in US terms and then follow that because if I rely on my memory to translate as I'm going, I usually screw up. :) Looks like it is an easy pattern to do. Have fun! I need to put Christmas away now. 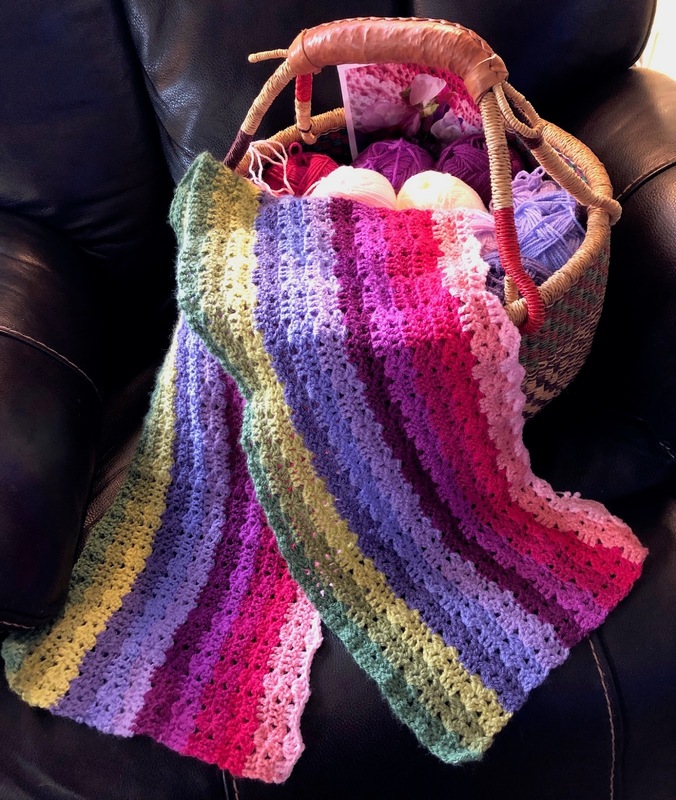 I can't crochet but oh how I wish I could when I see beautiful blankets like this. The colours and the pattern are just so pretty. Christmas is all packed away here too and it's nice to be able to get in the corners to clean again. Your blanket is looking beautiful Theresa! I love this colour order. Great to catch up with your news. He is so adorable. I am loving your blanket Teresa, so colorful!